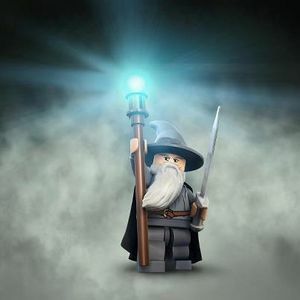 Gandalf, also referred to as Gandalf the Grey and Gandalf the White, is a minifigure based on one of the main characters in The Lord of the Rings, an Istar who helped free Middle-earth from the Dark Lord Sauron. He was first introduced in May 2012, featured in one set, then again released for The Hobbit theme, in 2012 as well, featured in three sets. He made an appearance in two 2013 The Lord of the Rings sets as Gandalf the Grey without a hat and cape, and as Gandalf the White, in a completely new design. Gandalf also makes a microfigure appearance in 3920 The Hobbit: An Unexpected Journey. Gandalf has four physical variants, and two video game ones. The first physical one is Gandalf the Grey, the second one again is Gandalf the Grey, but without a hat and cape, the third one is Gandalf the White, and the fourth one is a Gandalf the Grey microfigure. In the video game there are two variants of Gandalf, one depicting him as Gandalf the Grey, the other one as Gandalf the White, after his resurrection. 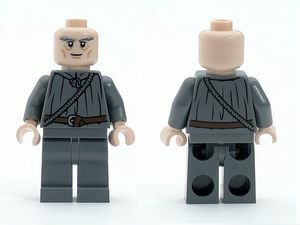 The Gandalf the Grey minifigure appears in five sets. He has plain grey legs, and a grey torso piece. The torso has printing present on the front and the back, depicting a brown belt with a silver clasp, and black printing for outlining the folds and features in his robe, as well as a strap going over his left shoulder. His hands are light nougat, as is his headpiece. The headpiece features black eyes with white pupils, grey eyebrows, a smiling black mouth, and a dark skin colour for the outlining of facial features. Between the head and the torso is a light grey beard of a mould exclusive to him, and a dark grey cape. Gandalf also comes with other accessories - a dark grey wizard hat, and a brown staff in all of his appearances, and in 79010 The Goblin King Battle, he has a sword, which represents Glamdring, in addition to his other accessories. In 79005 The Wizard Battle, he is the same as his regular grey variant, except for not having a hat, and besides that, a hairpiece, which is the same as Professor Dumbledore's. He does not have a cape either. The Gandalf the White minifigure appears in 79007 Battle at the Black Gate. He has a white beard/hairpiece, which is also be used for Saruman, and a white cape. He has grey eyebrows, similar to the ones in his grey variant, black eyes with white pupils, and a light nougat face, his mouth being covered by his beard. He has a white torso with a brown belt, white arms, light nougat hands, and entirely white legs. He also has a white staff. 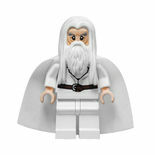 A Gandalf the Grey microfigure is included in the game 3920 The Hobbit: An Unexpected Journey. As a microfigure, he is dark grey, with face and beard printing on the front of the head area, and a continuation of the beard and a brown belt on the body. On top sits a hat which is made of two dark grey pieces. 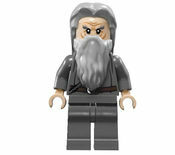 Gandalf appears in LEGO The Lord of the Rings: The Video Game, with two variants. One is based on Gandalf the Grey, with a grey hat, a grey cape and grey robes, while the other is based upon Gandalf the White, featuring white clothing and white hair. Both variants are armed with a staff which can use magic, and a sword. Gandalf the Grey's staff is brown with a gem on top, and Gandalf the White's is entirely white. Gandalf the Grey (later Gandalf the White), also known by other names such as Tharkûn (to the Dwarves), Olórin (in the West), Mithrandir (to the Elves and Gondorians), and Incánus (in the South), was a Maia (minor god/angel). He was one of the five Maiar sent by the Valar to help aid the people of Middle-earth in the fight against evil. These five Maiar were known as the Istari (Quenya: "Wise Ones"), or more commonly, wizards. The other four Istari were Saruman the White, Radagast the Brown, Pallando the Blue, and Alatar the Blue. Gandalf had a particular fondness of Hobbits, adopting some of their ways of life, such as smoking pipe-weed. In The Hobbit: An Unexpected Journey, Gandalf, Bilbo Baggins, and a company of thirteen Dwarves set out to go on a journey to the Lonely Mountain, to defeat the dragon Smaug and reclaim the dwarven horde treasure and their home. During the mission, Gandalf declared possession of the sword, Glamdring, the company had found in a cave, after a mishap with trolls. In The Fellowship of the Ring, Gandalf arrived for Bilbo's eleventy-first (111th) birthday party in Hobbiton. After Bilbo's party he headed out for Minas Tirith, to read an account of Isildur. Several years later, when Gandalf came back to Hobbiton to see Frodo, and found out the ring Frodo currently had in his possession had elvish markings on it, as did the Rings of Power. He later went to Isengard to speak with his friend, Saruman the White. Saruman betrayed Gandalf, telling him they should join forces with Sauron. Upon disagreeing with Gandalf, Saruman engaged in a duel with him, followed by Gandalf's defeat. Afterwards, Saruman took Gandalf to the top of the tower of Orthanc, and they continued their battle. Gandalf escaped Orthanc on the Lord of all Eagles, named Gwaihir, and with him he flew to Rivendell. There in Rivendell, the fate of the Ring was decided in the Council of Elrond, and the Fellowship of the Ring was formed. Gandalf then lead the Fellowship to the Pass of Caradhras, and after Saruman turned the weather against them, Gandalf lead them to Moria, as Gimli suggested, where he fell protecting the Fellowship from a Balrog (Durin's Bane as the Dwarves called it), that had been sleeping deep into the mines. Gandalf then fought the Balrog, and after a long battle, impaled him with Glamdring, his sword, defeating the Balrog and then having sustained such brutal injuries, passed away. Gandalf returned in The Two Towers, as Gandalf the White, who had returned to complete his task. In Fangorn Forest, Aragorn, Legolas, and Gimli found Gandalf as the White Wizard. They traveled to Edoras, to "awaken" King Théoden who had been poisoned by Saruman. When Gandalf turned Théoden back to his old form, Théoden threw Gríma Wormtongue out of Edoras. Gandalf left Aragorn, Legolas, and Gimli and went to bring back Éomer and a pack of Rohirrim back to help Rohan. They came to Helm's Deep on "first light on the fifth day". And only with the help of Gandalf, Éomer, and the Riders of Rohan, Rohan won the Battle of Helm's Deep. In The Return of the King, Gandalf, Théoden, Aragorn, Legolas, Gimli, and a group of Rohirrim rode from Helm's Deep to Isengard, to deal with Saruman. They found Merry and Pippin at the entrance of Isengard. Then they went to the center of Isengard, the tower of Orthanc. They found Treebeard there, who told them they had Saruman imprisoned in his tower. Then Pippin saw a shiny light in the water, which turned out to be the Palantír. Gandalf then quickly took the Palantír from Pippin. At night, after they went to Edoras, Pippin secretly looked into the Palantír and saw the White Tree of Gondor, in Minas Tirith, burning. Sauron's plan was revealed. Gandalf and Pippin rode to the White City to see Denethor, Lord and Steward of Gondor, father of Boromir and Faramir. Denethor told Gandalf that he will not give away his position and won't let Aragorn be king of Gondor. Gandalf reminded Denethor that the authority to deny the return of the king has not been given to Denethor. During the Siege of Gondor, Gandalf took command, and helped the soldiers of Gondor against the Forces of Mordor. Pippin came running, telling him that Denethor is trying to burn his son, Faramir, alive in a pyre. Gandalf managed to get Faramir out, but couldn't stop Denethor from burning himself. Gandalf later fought at Battle of the Black Gate. After the Ring was destroyed, with the help of the Great Eagles, he brought Frodo and Sam to Minas Tirith. He crowned Aragorn as King of Gondor. He left Middle-earth on the last ship set to sail to the Undying Lands with Elrond, Galadriel, Celeborn, Bilbo and Frodo. Gandalf makes a cameo appearance as one of the Master Builders to attend the meeting, and gets frustrated at Vitruvius when he mixes up his name with Professor Dumbledore's. He is voiced by Todd Hansen in the film. Gandalf the Grey is believed to be the oldest and wisest wizard in Middle-earth. His fireworks are quite spectacular, too. But it takes more than fireworks to overcome the dangers and threats the Fellowship face on their quest. Gandalf has long fought against the uprising of evil. His most trusted magical weapon is his staff. It can be used to cast spells, and it makes for an excellent walking stick. He alone can lead the Fellowship, help them find their way through mountains, mines and myriads of enemies...and if in doubt, always follow your nose. Even as all hope seemed lost when Gandalf the Grey was flung into the deepest of fires by the Balrog, he battled and finally defeated the demon. He strayed out of thought and time and returned as Gandalf the White to destroy evil and restore peace in Middle-earth. Gandalf the Grey is one of the most powerful Wizards in all Middle-earth. His most trusted magical weapon is his staff. It can be used to cast spells, and it makes for an excellent walking stick. He joins the quest to reclaim the Dwarf Kingdom of Erebor and the long lost treasure from the fire-breathing dragon, Smaug. Along the way, Gandalf finds clues that an ancient evil may have found its way back into the world. To uncover the truth, Gandalf must leave his friends to fend for themselves, as he embarks on a journey that will take him into darkest corners of Middle-earth. In 9469 Gandalf Arrives, Gandalf has many different LEGO pieces in the back of his cart. They are the following: a letter and a carrot. There are also three fireworks: a yellow stick with a white piece on top, a light grey stick with two green pieces on it, and a red Ninjago viper piece which represents the dragon firecracker. His beard piece is exclusive to him. Saruman's beard is shared with Gandalf the White's, though minus the grey paint applications that Saruman had. His wizard hat is the first one to come in dark grey. In 79005 The Wizard Battle, Gandalf has the same hairpiece as Sensei Keiken, Professor Dumbledore and Argus Filch in light grey. Gandalf the Grey Gandalf the Grey is one of the most powerful Wizards in all Middle-earth. His most trusted magical weapon is his staff. It can be used to cast spells, and it makes for an excellent walking stick. He joins the quest to reclaim the Dwarf Kingdom of Erebor and the long lost treasure from the fire-breathing dragon, Smaug. Along the way, Gandalf finds clues that an ancient evil may have found its way back into the world. To uncover the truth, Gandalf must leave his friends to fend for themselves, as he embarks on a journey that will take him into darkest corners of Middle-earth. This page was last edited on 22 April 2019, at 04:23.